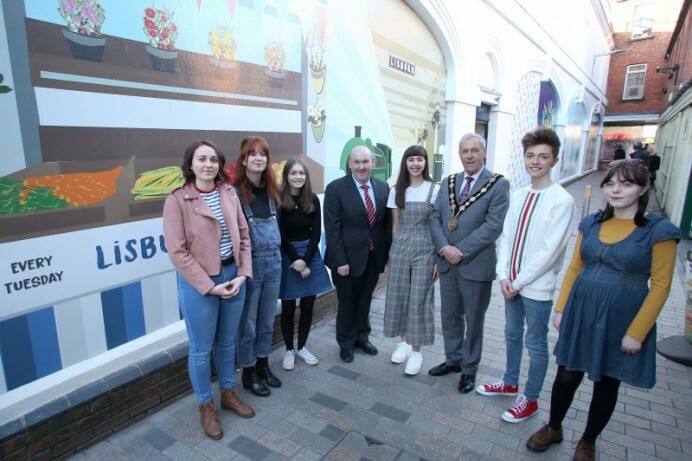 The council has been working closely with staff and the Art & Graphic Design Students from SERC to transform Haslems Lane in the heart of the city centre for a number of months to develop designs depicting stories of the history and life in Lisburn. The students then, using their own interpretation of the images, recreated them in the archways of Haslems Lane creating a vibrant and interesting walkway from Bow Street through to Lisburn Square. Chairman of the council’s Development Committee, Alderman William Leathem attended the installation event with the council’s Chief Executive, David Burns and the Mayor, Councillor Uel Mackin. This project was part-funded by the Department for Communities and forms part of a wider initiative to develop two pocket parks, install planting and displays across the city centre to improve tired and derelict sites.